We write to offer our warm thanks and appreciation for the gracious generosity and historic hospitality that the South African government and the South African people have offered to President Jean-Bertrand Aristide and his family over the past seven years. 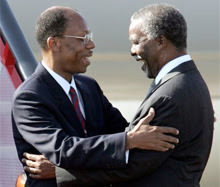 South Africa's action in offering a home to the Aristides, following the coup d'état in 2004, was an act of brotherhood in keeping with the many acts of international solidarity shown towards the people of South Africa during their long walk to freedom. This deed will be remembered by the people of Haiti and the world. Now, at last, the Aristides can return to Haiti, and their exile can end. Finally, all signs now point in that direction. President Aristide has again indicated his desire to return home and assist the people of Haiti. He has said he is ready to go at any time, and his passport has been issued. All the last remaining obstacles to the Aristides' return have been removed. Expectations in Haiti have been raised, and many eagerly look forward to his return. The Aristides' arrival in Haiti will raise the spirits of the Haitian people at the time when they most need it. We write in the hopes that you can assist the Aristides in making their transition as soon as possible. The situation in Haiti remains dire, and the Aristides have expressed their willingness to help Haiti rebuild, through education initiatives and in other desperately needed areas. Many people in Haiti have been greatly inspired by the news of the issuing of President Aristide's passport – some even travelling miles to the airport to greet his return, spurred on by false rumours of his imminent arrival. Any delays to the Aristides' prompt travel to Haiti would be yet another disappointment to a people that have already experienced a long list of tragedies, disasters and heartbreak. As long-time supporters of freedom and justice in both South Africa and Haiti, we again extend our gratitude for the important role that South Africa has played in hosting the Aristides. We also heartily support the efforts of the South African government to assist President Aristide and his family in quickly returning home. And we hope to see President Aristide in Haiti very soon.